Whittier police have arrested a 19-year-old after the SUV he was driving rolled over and killed one of five high school students inside. Police suspect that the driver, Daniel Vasquez, was driving drunk. The crash took place at about 11:30 a.m. on Tuesday, April 26, at the 8400 block of Villaverde Drive. According to reports, Vasquez was speeding on Villaverde Drive, headed southbound from Mar Vista Street. He lost control of the vehicle, which was carrying five teens who were students at Whittier’s La Serna High School. The SUV drove onto the sidewalk where it hit a large brick mailbox before rolling over onto its roof. A 14-year-old girl, Ivette Macias, was killed in the crash. The other four teen occupants were seriously injured in the violent single-vehicle rollover accident. Two girls, ages 14 and 16, were in critical condition and airlifted to hospitals. The other three – Vazquez, a 15-year-old boy and a 14-year-old girl – were transported by ambulances. Vazquez was arrested as soon as he was released from the hospital. Vazquez was taken to jail and held on suspicion of vehicular manslaughter and felony DUI. A witness reported that it sounded like the vehicle was driving “awfully fast.” The witness also reported that he was the first person on the scene and he saw beer cans scattered outside the SUV. Vazquez, of Whittier, is being held in lieu of $100,000 bail; his arraignment date has not yet been set. As the Whittier crash illustrates, driving drunk is incredibly dangerous. Drivers who choose to do so in California face both criminal and civil consequences. In cases where there are no injuries, the driver can still face immediate license suspension, fines, and jail time. 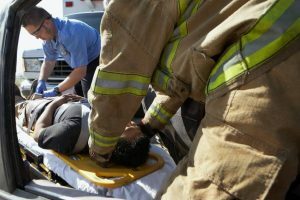 Where an innocent victim is hurt, the driver may also be liable for the injuries. Compared to the run of the mill minor fender-bender, the injuries in drunk driving accidents tend to be much more severe and likely to result in both physical and financial hardships. The law recognizes these hardships and those who are injured by a drunk driver, or their loved ones in the case of a fatality, may be entitled to compensation from the driver or another liable party. Compensation may include past and future medical expenses, pain and suffering, lost income, loss of companionship, and in the case of a wrongful death, funeral expenses. Other liable parties may include the owner of the vehicle if it was not the drunk driver’s, or a bar or someone else who served the driver alcohol. There is no standard drunk driving case. Each tragic DUI crash has a different story and presents unique legal challenges. Experienced personal injury lawyers at Ellis Law have the expertise to spot and handle those issues while taking the time to put the client first. If you or a loved one have been injured in a DUI accident in or around Los Angeles, call 310-641-3335 for a no-cost review of your case. We do not get paid unless we collect an award or settlement for you.